From the airport I took the metro to the Zocolo, or main square, where I booked a room at Hostel Moneda. The metro ride was 2 pesos, less than a quarter. I was lugging my backpack, a dry bag, a computer bad and a travel guitar through all the stations. I’m going to send some stuff back home when I’m in Miami, I think. I barely made it on one train, the doors closing on my backpack. I quickly shoved the doors back open, like I’ve seen done on BART, and made it all the way inside. At the hostel I emailed Mike, Caroline’s brother, and made arrangements to meet him at 9pm at the Sevilla metro stop, which was by his hotel. In the meantime I wandered around the Zocolo, checking out the tourist spots. 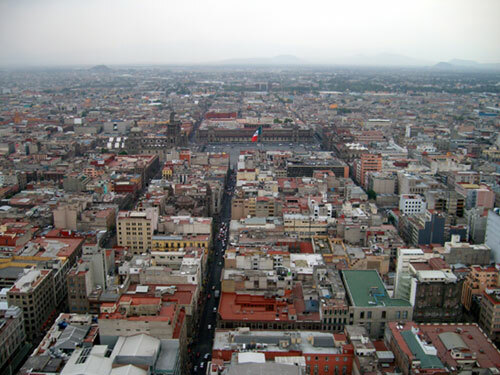 I took an elevator up to the top of Torre Latinamericana and saw some outstanding views of the city. The hostel I’m staying at has free dinner, so I ate up and prepared to meet Mike. I greeted Mike and his girlfriend, Lalune. Both parties were 15 minutes late but we all arrived at the same time. Lalune is here on business and Mike came down for vacation to visit her. Lalune said that she made plans to go to an art galley showing that her friend knew about at Restaurante del Lago in Chapultepec Park. We hoped in cab and went there. It was a swanky event and I was easily the worst dressed in my t-shirt and jeans, Mike being the second worst. I was thinking it would be more bohemian, like an SF gallery. I was wrong. It didn’t really matter because I couldn’t dress up had I known; I didn’t bring any nice clothes on this trip. There was an open bar and hour d’ouvers. And art. We stayed until about midnight and went back to their hotel. Lalune went to sleep and Mike and I looked around for a bar that was closed by then. Today I went to the Musem of Caricature and saw some of the work of Jose Guadalupe Posada, an artist who I like, famous for his depection of bourgeois as skeletons. I also got a caricature of myself drawn. You can see it in the photos section. At noon I met up with Mike and Lalune and we went to the Anthropology Museum in Chapultepec Park. There they had rooms full of Aztec, Mayan, and other indigenous artifacts. After a grueling three hours of museum wandering, we went to Polanco, the neighboring yuppie district, for a drink and a snack. Right now I’m in the hostel and going to meet up with Mike and Lalune again for some drinking. Tomorrow I go to Miami to meet Adam.